We investigate how differently-constructed indices for North Atlantic sea-surface temperatures (NASSTs) describe the “Atlantic Multidecadal Variability” (AMV) in a suite of unperturbed as well as externally-forced millennial (pre-industrial period) climate simulations. The simulations stem from an ensemble of Earth system models differing in both resolution and complexity. Different criteria exist to construct AMV indices capturing different aspects of the phenomenon. Although all representations of the AMV maintain strong multidecadal variability, they depict different characteristics of simulated low-frequency NASST variability, evolve differently in time and relate to different hemispheric teleconnections. Due to such multifaceted signatures in the ocean-surface as well as in the atmosphere, reconstructions of past AMV may not univocally reproduce multidecadal NASST variability. 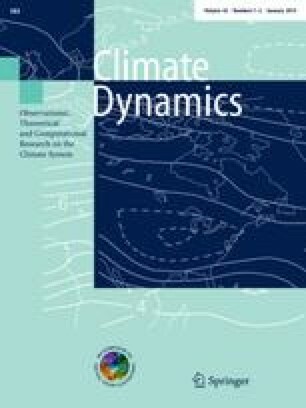 AMV features under simulated externally-forced pre-industrial climate conditions are not unambiguously distinguishable, within a linear framework, from AMV features in corresponding unperturbed simulations. This prevents a robust diagnosis of the simulated pre-industrial AMV as a predominantly internal rather than externally-forced phenomenon. We conclude that a multi-perspective assessment of multidecadal NASSTs variability is necessary for understanding the origin of the AMV, its physics and its climatic implications. The authors thank two anonymous reviewers whose comments helped to improve the study and Katja Lohmann for useful comments on an early version of the manuscript. This research was supported by the Max Planck Society for the Advancement of Science. This work was funded by the Federal Ministry for Education and Research in Germany (BMBF) through the research program “MiKlip” (FKZ:01LP1158A). O.B. is funded by the DFG through the Cluster of Excellence CliSAP, University of Hamburg. J.B. is partly funded by the DecCen project funded by the research council of Norway. J. H. J. received funding from the European Community 7th framework program under grant agreement GA212643 (THOR: “Thermohaline Overturning—at Risk?”, 2008–2012). We acknowledge the World Climate Research Programme’s Working Group on Coupled Modelling and the participating groups for producing and making available the model output.